Limited to 450 copies worldwide, CALIBRO 35 new 45 vinyl taken from Traditori Di Tutti. 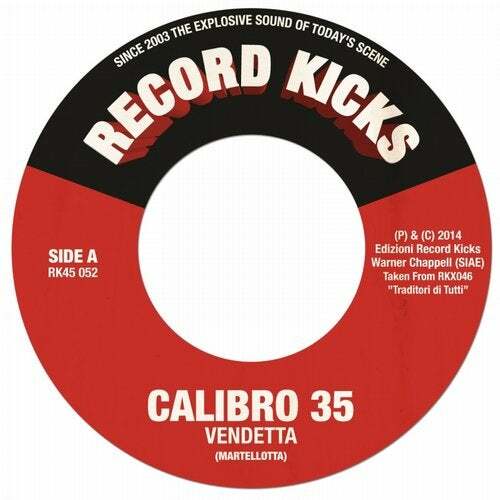 "Vendetta" is Calibro 35 new 7" single from Traditori di Tutti, their latest latest LP on Record Kicks and is available in a limited edition 45 and digital download. On the A side Vendetta is an Alan Morehouse, KPM's Alan Hawkshaw style stormer with an epic Morricone gran finale. On the 45 flipside dirty crime funk mover "You, Filthy Bastards". "This is the sound of The Godfather as co-directed by Quentin Tarantino" Alarm Magazine USA.